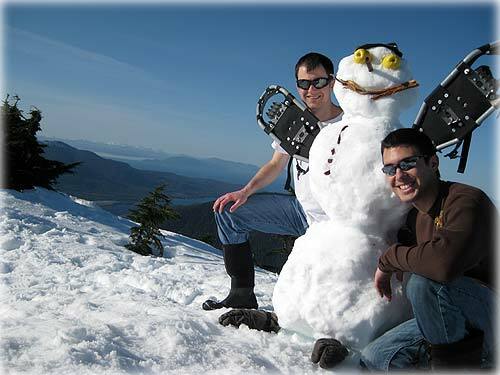 Wes Savage (left) and Jeremy Speedy (right) pose with the snowman they made on the top of Deer Mountain. The snowman's "buttons" are made of beef jerky, his eyes apples, his nose a knife with the handle being the visible part, his mouth a piece of wood, and his arms are snow shoes. Ketchikan: Murkowski Announces Sealaska lands bill Meeting in Ketchikan - U.S. Sen. Lisa Murkowski, R-Alaska, announced Thursday a Ketchikan town meeting on the Sealaska lands bill. The meeting in Ketchikan will be among a series of public meetings scheduled to be held on Prince of Wales Island and in Southeast Alaska the week of March 8. Saturday, March 13: 12 p.m. ­ 3 p.m. at the Ketchikan Borough Assembly Chambers - 1900 First Ave. - in the former White Cliff School building. Fish Factor: Skimpy landings of season's first fresh halibut By LAINE WELCH - Blustery winds and high seas were set to put a damper on Alaska's March 6 halibut opener, and prices were expected to be artificially high for skimpy landings of the season's first fresh fish. "That's the question of the day," said one Kodiak halibut buyer. "It's hard to say how it will shake out," agreed Matt Moir, manager at Alaska Pacific Seafoods, one of Kodiak's largest processing plants. "The weather forecast is not good and frozen inventory is low, but the market won't sustain goofy prices. If it gets too high the market will shutdown." Talk on the waterfront pegged starting prices at Homer at around $5 a pound, but no word from elsewhere until deliveries start hitting the docks. Last year's starting prices were in the $3-$3.50 range, down more than a dollar from the previous two years. Halibut prices usually drop after the first month, when the market starts to settle out. Marketers expect about 4.5 million pounds of halibut will move to restaurants and supermarkets in the first month of fishing this year. Overall, there will be less of the big flatfish to go around during the eight month season ­ the coast-wide catch of 50.6 million pounds is a 6.4% decrease from last year. That includes fisheries in British Columbia, the West Coast and Alaska. Alaska provides 80% of the North Pacific halibut harvest, and this year's catch limit is 42.3 million pounds, a drop of 3.3 million pounds from 2009. More than 2,100 Alaska longliners hold catch shares of halibut. Homer holds the title of the nation's #1 port for halibut deliveries, followed by Kodiak, Seward and major ports in Southeast. Dutch Harbor also ranks as one of Alaska's biggest ports for halibut landings. In fact, the largest halibut ever caught at 459 pounds was taken from Unalaska Bay. The sablefish (black cod) fishery also opens at the same time as halibut. Both fisheries end in mid-November. Alaska Science: Mummy ground squirrel tells of a different Alaska By NED ROZELL - One fall day in Interior Alaska, a lion stalked a ground squirrel that stood exposed on a hillside like a foot-long sandwich. The squirrel saw bending blades of grass, squeaked an alarm call, and then dived into its hole. It curled up in a grassy nest. A few months later, for reasons unknown, its heart stopped during hibernation. in Alaska about 20,000 years ago. 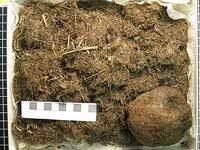 Twenty thousand years later, Ben Gaglioti is teasing apart the mummified ground squirrel's cache in an attempt to better reconstruct what Alaska was like during the days of the mammoth, bison, wild horse and camel. Gaglioti is a graduate student with the University of Alaska Fairbanks Institute of Arctic Biology and the Water and Environmental Research Center. He is using tools ranging from tweezers to an isotope-analyzing device in his attempt to sift Alaska's distant past from the midden of a ground squirrel that perished during the last ice age. At that time, from about 14,000 to 45,000 years ago, North America looked much different than it does today. For one thing, blue ice one mile thick was pressing down on Toronto and Chicago. Massive sheets covered much of the continent, but northern Alaska was a grassland, part of what UAF scientist Dale Guthrie called the "Mammoth Steppe." The Mammoth Steppe blanketed the top of the globe from about France to Whitehorse. It was cold, dry, and featured grasses and sedges. So rich were the feeding grounds that the ancestors of today's animals were jumbo versions. "Sheep, bison, caribou, and other ruminants on the Mammoth Steppe were giants," Guthrie wrote in "Frozen Fauna of the Mammoth Steppe." Science: Study: Arctic seabed methane stores destabilizing, venting - A section of the Arctic Ocean seafloor that holds vast stores of frozen methane is showing signs of instability and widespread venting of the powerful greenhouse gas, according to the findings of an international research team led by University of Alaska Fairbanks scientists Natalia Shakhova and Igor Semiletov. Ketchikan: KETCHIKAN 1912-1918: A NOSTALGIC PHOTO ESSAY - The Tongass Historical Society & The Ketchikan Museum Department will present postcard images of Ketchikan in the early 1900s. The photographs taken by Ketchikan photographer David Nicoll, will be the subject of a free multi-media program at the Ted Ferry Civic Center on Wednesday, April 10th at 7:00 pm.. Dozens of vintage photos from the collections of the Tongass Historical Society and the Ketchikan Museum Department will recreate the mood and feel of the community almost 100 years ago. The images presented will range from townscapes to the comings and goings of ships and boats on the waterfront. All were printed on postcards for sale to tourists and proud local residents. Ketchikan: KETCHIKAN COMMUNITY CONCERT BAND PRESENTS "XTRATUF" CONCERT - The Ketchikan Community Concert Band's annual "Lightweight Concert" is being renamed this year. Its new name is now the XTRATUF CONCERT. Conducted by Roy McPherson, the band is ready to present you with a combination of excellent musical arrangements with some surprises. Two pair of XTRATUF boots, donated by North Safety Products and Tongass Trading Company, will also be given away in a drawing. The performance will open with our state song, "Alaska's Flag" augmented by voices from the Ketchikan Community Choir led by Steve Kinney. Next is "Olympiada", opening with an Olympic-style fanfare, and written in an attempt to capture the feelings of intense glory and pain that are inspired by the Olympic Games. "Footprints" is a new piece written by Matthew Sexton, the University of Florida band symphonic band conductor. It features horn player, Mary Kurth, our Schoenbar Middle School music director. Gershwin fans will enjoy " I Got Rhythm", " 'S Wonderful", "Fascinating Rhythm", "Rhapsody In Blue" and other recognizable songs in "A Tribute to Gershwin". William Latham wrote "Brighton Beach" in 1954, and it is one of his most popular marches and one of the band's favorites. James Swearingen's lyrical "Follow the River" will be followed by "The Golden Age of Rock and Roll" which includes "At the Hop", "Runaround Sue" and "Little Darling". S 881: A BAD HISTORY FOR A BAD BILL By Alan Stein - If S 881 passes out of a US Senate committee next month, Southeast Alaska and the nation will be worse off. Here is an untold story behind the legislation.